Card trick exchange center. Share card tricks with other magicians worldwide. All degrees of difficulty for every level of skill. Electronic books and magazines about magic and magicians. Free downloads. Slighly biased directory of links presented by Natzler Enterprises. Add your magic business or service for free. Professional magic catalog of tricks, illusions and magician supplies. Free magic tricks. Extensive, ever-growing site dedicated to everything involving Magic And Illusion. Features include: Online Magic Shop, Interactive Tricks, Magic Library, Magic Museum, Magic Sites. Free online magic tricks, card tricks, optical illusions, fortune telling and classic games. A magic forum with areas to discuss all aspects of magic. Included weekly news and links to other magic site. Performs walking close-up magic, magic for childrens parties, and comedy-magic. 9 Lance Burton Official site. Official site. Learn magic secrets behind Burtons popular magic tricks, join his Magic and Fan Club, and buy magic tricks. Magic tricks, card tricks: news for magicians, magic entertainers and performers. Magicians database, an online magic course, magic news and magic history. Party favor bags to complement a magic or wizard theme. Magic tricks also include instructions. Close-up magic, street magic pre-packaged tricks, magic forum and demo videos, resource links. Performing Stage Magic, Close-Up Magic and Balloon Sculpture for your next party, meeting or special event! Closeup and stage magic and illusionist shows. Includes booking information and a sample video of close-up magic. Real online magic. A different magic trick every month. Motivational presentations which incorporate magic and humour, for executives, product launches, corporate and community events. Also performs as master of ceremonies, stage magic and close-up magic. Closeup and stage magic and illusionist shows, which can be adjusted to suit audience and location. Includes booking information and a sample video of close-up magic. a series of free colorfully illustrated original creation myths for kids. Free magic tricks, both written and embedded YouTube videos, with related articles and feeds. Downloadable teaching videos, free tips and tricks in magicians section, links. Magic, Magicians, Illusion, Calendar, MagicSearch. The Ultimate Magic Guide to the internet. Comprehensive positive review by Washington Post staff writer Peter Marks. May require free registration. the magic of painting - free painting lessons on-line for the beginner to the advanced. A sampling of some tricks from a full commercial kit. includes artist of the week, full-color gallery, questions and answers, readers tips, free newsletter and email. sponsored by the magazine. Original close-up and stand-up magic, books, and tricks with presentations for sale. Free articles, reviews, tricks, and discussions. Magic news, resources, reviews, interviews, links of fame, and daily news and information feeds webmasters can add to their site. Guide to magic dealers offering magic props, books and videos for magicians. Face painting, balloon sculpting and magic. Photos gallery. Actor and magician. Close-Up mindreading and magic. Magic products. Fantasyworks Magic, music and magic in Williamsburg. If the business hours of FalseCuts - The Card Trick Exchange Center in may vary on holidays like Valentine’s Day, Washington’s Birthday, St. Patrick’s Day, Easter, Easter eve and Mother’s day. We display standard opening hours and price ranges in our profile site. We recommend to check out falsecuts.com for further information. 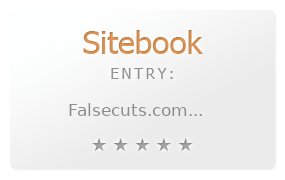 You can also search for Alternatives for falsecuts.com on our Review Site Sitebook.org All trademarks are the property of their respective owners. If we should delete this entry, please send us a short E-Mail.